Sometimes writers need to take a fresh perspective, a new approach, an unexpected tack. 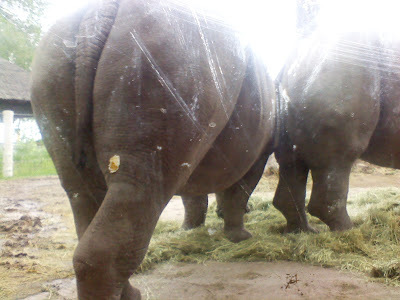 When my family went to the zoo, certain animals were more visible through plexiglass windows than over their enclosure railings. Guess what I saw at the rhino pen? Aw, how did you know? I can't help it that this view really struck my fancy. Some people think it, but I go ahead and say it. I had to take a picture with my phone because the guy holding the fancy-pants camera didn't appreciate my subject matter. But, hey, why fight it if something resonates with the funny bone in my twistedly creative mind? (And, may I add, I'm not the only person on the planet with funny bones in the brain!) You've got to admit that this is a classic composition. I simply couldn't resist! What is hard for you to resist? "It's better than your paint shirt"
I hate shopping. But when my sisters took me with them to find performance outfits for our singing group "My Sisters and Me," I was swept away on the shopping tide and brought home some clothes to try on. (Maybe that's why I hate shopping!) When I asked my youngest his opinion on a certain dress, he frowned and said, "I don't really like it, but it's better for going to grocery store than your paint shirt." I took the dress back. 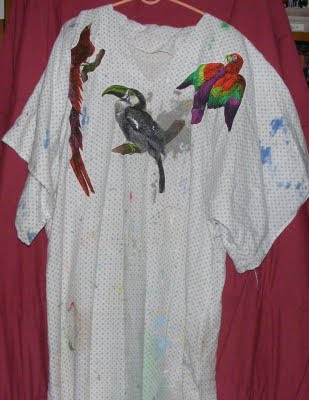 I have this great shirt, a former nightshirt that serves as a paint and project cover all. At the end of a recent painting project, my youngest pestered me to go to the store with him. "But I need to change." "No you don't," he said. "Really? You wouldn't care if I went to the store in this?" I spread my hands to show off the splattered shirt hanging nearly to my ankles. "I don't care," he insisted. "Let's go." So I went. In the first aisle, my son looked at me sideways and said, "You look funny." "You're the one who didn't want me to change," I said, plucking a bag of raisin bran off the shelf and tossing it in the basket with a flourish. I figured if anybody at the grocery store cared to stare, I'd give them something to talk about. What have you seen in the unusual clothing department lately?